No Christmas has not come early but I am definitely missing that sweet, paunchy generous old man. And the reason lies in my son’s faith in him. Most of the days the husband comes home way past midnight and by then the baby is wide asleep. The days when his father his lat its difficult to put him to bed. He wants his father by his side and gets sad if he is not there. But now with time he also has started to understand the situation and when last week his father again could not make it for his bedtime he said something that got me thinking. After I had finished reading to him and tried to tuck him in the bed he said ‘Baba akhon Santa clause hoe geche. Ami ghumie porlei ese jabe” (father has become Santa caluse, will only come when I am asleep). Later while cleaning up the kitchen I started thinking. This December when he was too excited to have his first Christmas tree we told him all about Santa Claus. Who he is and how he brings presents to the kids. He wanted to wait for him on the Christmas night and then we told him that he only comes when the kids gets asleep. He knows we don’t get to see Santa Clause but he definitely comes and the proof lies in the presents that he gets to see in the morning. Similarly he gets to see his father coming until in the morning. It’s a beautiful innocent world for him and a beautiful gesture on behalf of Mr. Santa Claus too. I don’t give any brownie point to my hubby for this but how I wish if everyone has been as generous as Santa. Mainly leaving behind the gifts part. I am not keeping well for quite sometime. My hemoglobin level has gone down to its all time low which with some other problems make me feel exhausted all the time. Night sleep is also disturbed and the morning alarm at 6 makes it impossible for me to get proper sleep. but replenishing that in the afternoon is another problem. I have tried sleeping with the baby many times but with no result. The day I ever try to sleep in the afternoon someone comes for something. Either it would be the Iron wallah, the milkman, the sweeper, the courier guy, the car wash man, the paper wala, the magazine wallah, the driver or if nothing else then some phone call on the landline. And I hate Airtel or for that matter any of the mobile service companies for their scheduled 3’o clock marketing calls in the afternoon. And they are arrogant enough to tell their customers that they can call any time of the day. The frustration increases many folds when you have a small kid at home. Even just the other day I was telling friend about my relation with afternoon sleep and how its so difficult to get some quite zzzz time when you are alone in the house. Would not it be nice if we could all do our job silently without disturbing others? I understand the need of the courier guy and he doesnot come everyday but the other people? Trust me my lil one made me fall in love with Santa clause all over again. That fat old man with his chubby cheeks and big paunch has stolen my heart with his generosity. He comes in silently when we all are asleep and leaves the gift without any expectation. Most probably along with cookies will make this simui er payes for him this Christmas. The creamy thick sweet delight will definitely will please him. 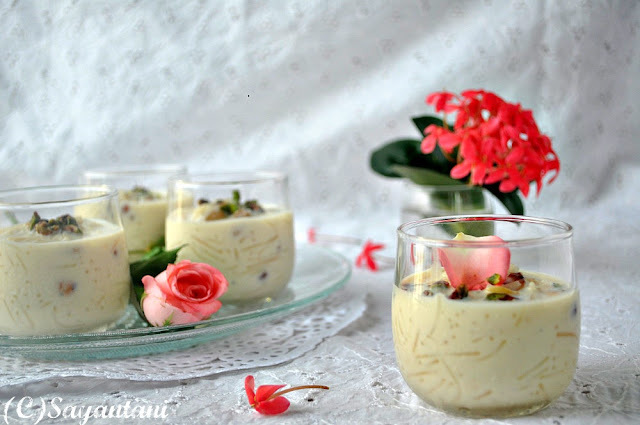 My simui er payes is almost like the famous Muslim Id special dessert sheer khurma, thick, creamy and rich with dry fruits. And I have a sure shot method to get the consistency right every time with soft and separate strands of thin vermicelli. Actually there are many varieties of vermicelli available with various thickness and its quite difficult to cook it without turning them into a mass. I prefer to cook the vermicelli separately to do away with this. Below is my method. Wash and soak the raisins in water. Keep aside. In a heavy bottom pan start boiling the milk on medium flame. Once it comes to a boil take out 11/2 cups of milk. Mix ¾ cups of water to it and keep separately. In another heavy bottom pan heat the ghee and fry the cashews till they turn light golden in colour. Drain and keep aside. In the same ghee start roasting the vermicelli on low flame till they also turn golden (approx. 4-5 minutes). Add the bay leaf and stir a few times. Now add half of the milk-water mixture. Stir continuously or it might stick to the bottom. Cook it till its cooked through but every strand separate approx. 8-10 minutes depending on the thickness of the vermicelli. Mix in the sugar and stir till it gets dissolved. Switch off the gas and keep aside. Mix the milkmaid to the boiling milk and stir continuously till it thickens and reduces to half of its original quantity. Mix in the boiled vermicelli, fried nuts and cook on low for another 3-5 minutes till you get your desired consistency. Mix in the soaked raisins and powdered cardamom. Stir and serve warm or chilled with some chopped pistachios on top. Between if you have not noticed already can I fetch your attention to the fact that I have moved to my own domain? Yes. A Homemaker's Diary is now ahomemakersdiary.com. Hope you will continue loving and encouraging this little space of mine. Showcase dessert at Divya's Culinary journey. Love the hakoba mat.Delicious payasa. thanks to you for the nice cup of payesh and the rose touch is really special indeed..
Love the pic and wishing you a good recovery from your health problems. Are you taking iron medicines for low hemoglobin? Eat lots of broccoli, spinach, drink wheatgrass juice, etc. I have the same problem too. 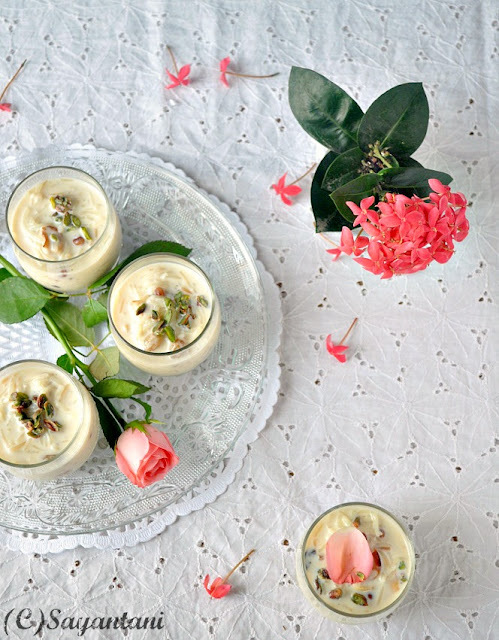 Rich looks super tempting pudding, wat an eye pleasing clicks,very attractive. and such sweet innocence of the kid! 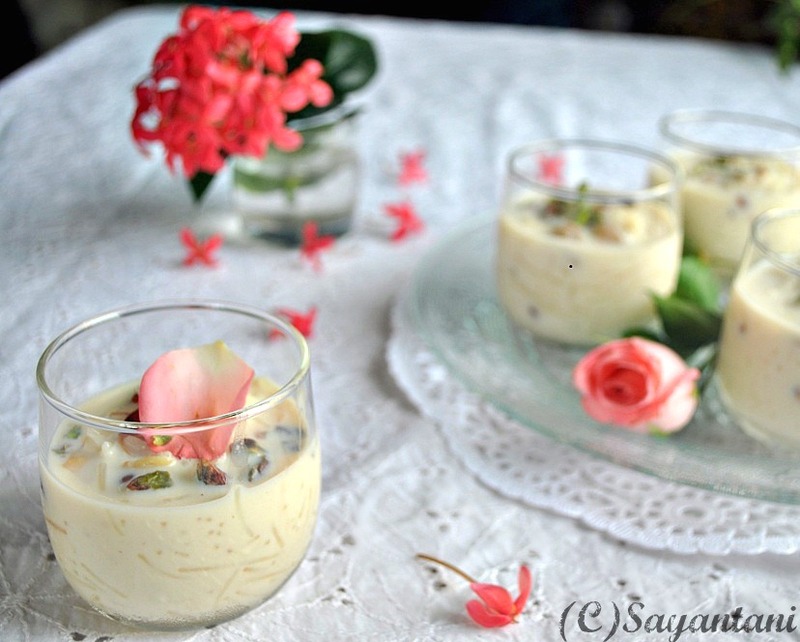 yummy.. i missed it.. n your presentation is beyond description..
Beautiful pictures Sayantani...Sevai kheer is my favourite Indian desert ! Your little son sounds like such a sweetheart ! I totally relate to the afternoon sleep part, just about everyone decides to come between 3 and 3.30 !! 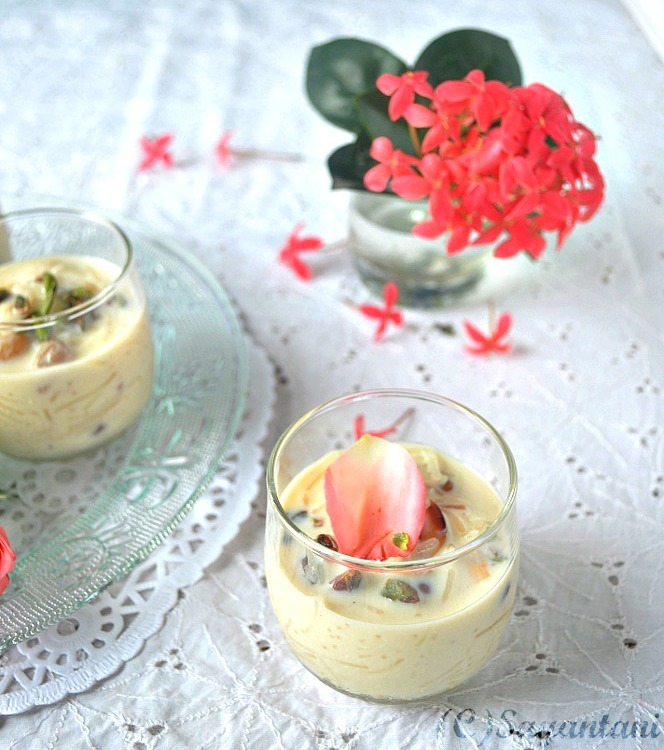 Beautiful and lovely cliks...Payasam looks tempting. afternoon sleep is such a bliss, which i never get!!!! with my 6-year old kiddo, the moment i close my eyes, he will have something interesting to show me!!!! What a pleasant presentation. Gorgeous. Beautiful presentation. Congrats on moving to your domain and do work on your hemoglobin dear. It will make you feel better.All the best. Ur sonny is such a darling :) Hope you are feeling better ..... I suggest keep your mobile on silent mode and the phone off the hook when u nap. Everything else can wait but not health ! Thatz first n foremost. Hope I don't sound like granny with so much gyan. The Payes looks divine ...... luv the clicks but my fav is the last one. Take care dear .... n hugs to the lil one. Love the pics and the color scheme. The payesh must have been delicious. @Bhakt, thats one of the nicest comments I have ever heard. if you are in Kolkata drop by will feed you this. @Finla, thats such a wicked idea...but absolutely love this. will try doing this with my broken french. @Nisha, no iron tablet or syrup for me. that makes me vomit almost immediately. am taking ayurvedic medicines and dietary supplements. thanks for the tip. will eat more broccoli now. @Arch, thanks Arch. this is a bad thing to have and today am feeling exceptionally bad. had to cancel tickets for going home too. lovely presentation.......great recipe....take the amway supplement for your haemoglobin..its organic..and pure veg!..it works wonders. as far as the afternoon nap goes..you should just shut yourself with your son in a room..phones on silent..and to hell with whoever comes knocking on the front door at 3 in the afternoon! this looks Lovely and yes, congrats for the new domain..
Mm..wonderful creamy texture. Love to taste it. Lovely presentation and congrats on moving to the new domain. Take care of your health as well. Take care of your health too girl. You just can't afford to be sick. Stay well. Hello Sayantani, You have a wonderful space too. Thank you for leaving that wonderful comment. Please keep visiting. Lovely pictures looks delicious and very creamy! Congrats on ur new domain! 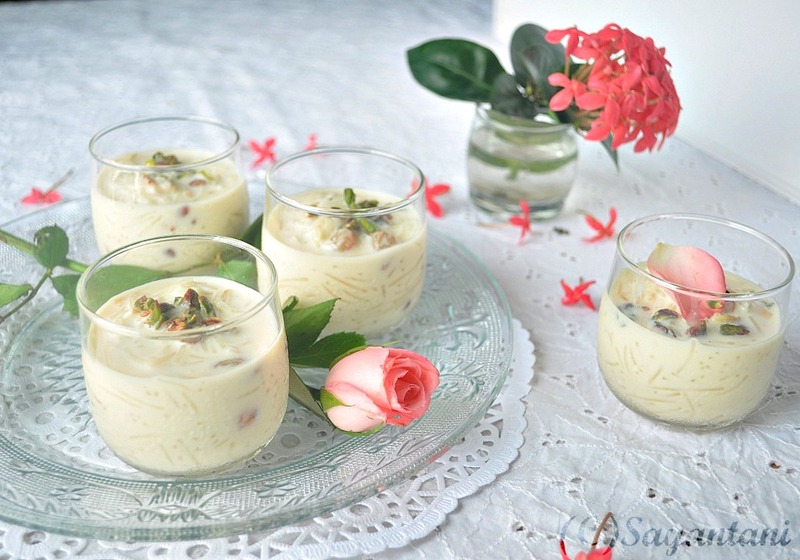 You have made a semia kheer take a new dimension altogether with your presentation. Perfect! Congratulations on your very own domain. 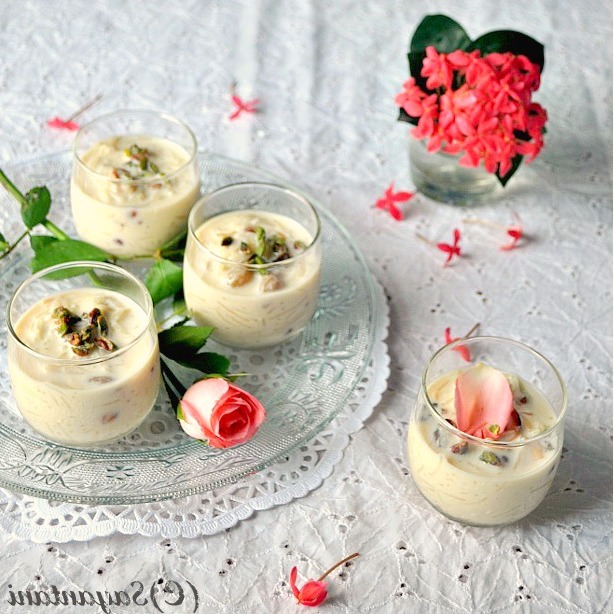 lovely presentation and delicious vemicelli pudding..loved your blog and awesome clicks..so well done!! Creamy and rich,love the presentation. Congrats on your own domain Sayantani..and absolutely gorgeous picture of simui..take care of your health and many tights hugs to cute prince..aw! bless him with all the good things in life..
Now a very big fan of vermicelli in such a form. But looking at it, I feel I have to to give it a go ! for sure. Truly good. I v tried few of ur recipes nd those really turned out well... such as Choco fudge cake. Black forest one nd few others too... wat I must say that am a great fan of ur cooking expertise as ur tips are not only simple but also practically experienced so I rely on them blindfoldedly..... wat I always do is wenever am on net to lookout for any recipes ialways ho through ur pages to find out if I can meet my lineups over here!! !